Very tiring. Although that was mostly the bout of insomnia last night. Here's a hint: try to get more than 4 hours of sleep before a day where you know you'll basically be spending 8 hours reading papers and taking notes. If so, you may be capable of finishing more than two. 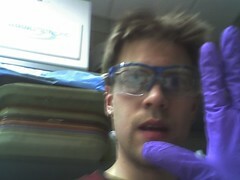 So I'm working as a Junior Scientist in the lab of Dr. John F. Soechting. As such, I'll also be working closely with my former advisor, Dr. Martha Flanders. At this point, the lab focuses primarily on interception (basically, visual tracking of a moving object) and the project I'll be working on, haptic synthesis. Some Hindoos were exhibiting an elephant in a dark room, and many people collected to see it. But as the place was too dark to permit them to see the elephant, they all felt it with their hands, to gain an idea of what it was like. One felt its trunk, and declared that the beast resembled a water-pipe; another felt its ear, and said it must be a large fan; another its leg, and thought it must be a pillar; another felt its back, and declared the beast must be like a great throne. According to the part which each felt, he gave a different description of the animal. In this tale, each person is performing haptic synthesis: the perception of objects by touch. Contrary to what the fable implies, haptic synthesis in humans is in fact surprisingly accurate. It's what humans generally rely on for the manipulation of objects. Close your eyes and pick something up off the desk in front of you. How long does it take you to decide what it is? Not very long, I'd imagine. How do we go about investigating this perception? Well, I'm so tired that I'm about to pass out so I'll leave you in suspense for now.